Well, it's done. 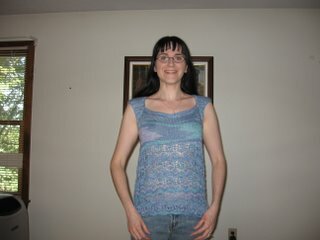 The seam on the left is a bit crooked, but the top isn't actually uneven -- I was tugging on it without a mirror before my husband took the picture. I like the way the colors pooled. My only complaint is that the neck won't stop rolling because my shoulders are too narrow. But there's nothing I can do about that. Details: SWTC Bamboo in Serendipity, a little over 2 skeins. 5 lace repeats, armholes and neckline worked by picking up 1 stitch every 2 stitches, not every 1 stitch. The effect is kind of nice. Not my usual color choice, but I'll wear it -- with another shirt under it. There's way too much midsection peeking through the lace! Congratulations! Great fit and lovely colours! looks lovely on you. I intend to wear mine over a cami - the world definitely does not need to see my middle regions! looks awesome! I remember when you first started to see the pooling, and your hesitation about the color: But it looks great on you! The changes you made to the fit are fantastic. My neckline rolls, too. Great job!